"Never to fade, never to be replicated, each hand-made individually designed piece holds its own unique beauty. Hand-made designer jewellery is shaped from anodised aluminium with fittings handcrafted from sterling silver. 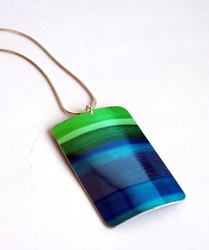 High quality materials are used in my vibrant designer jewellery and very wearable jewellery accessories. 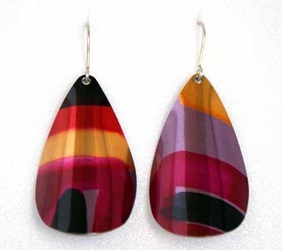 Trained in fine art painting, by hand I work colour into highly polished pieces of jewellery. My designer jewellery is recognised as dynamic wearable art. 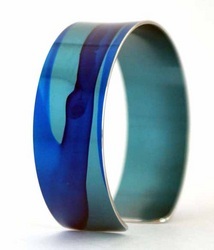 Aluminium is anodised to accept dyes and is hand-shaped into very fashionable bangles, bracelets and pendants. Focused on fine art rather than the applied arts, as a painter I use my sense and sensibilities avoiding pattern. My design is in shaping this creativity into subtle curves. 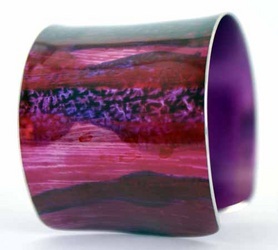 I do hope that you enjoy wearing my very wearable art!" "It is with great sadness that I write to tell you that Michael, passed away on 11 September 2012. He was diagnosed with colon cancer last June and he put up an incredible fight throughout,in fact at times it seemed that cancer had nearly met its match with Dad. He had an unfathomable enthusiasm and zest for life which he never lost throughout his illness, even the experts were dumbfounded by his independence and determination to carry on. He adored his art and jewellery and this passion was infectious and inspirational to others. He found beauty everywhere and anywhere from battered old objects in charity shops to the latest dazzling model on the Mercedes forecourt! He loved Cheltenham and even when he was undergoing treatment he would go for long walks in the Cotswolds whenever he could. Recently he commented about looking back on his life and what he'd achieved. "Well I never”, he said, “Well I never did. What a lot has happened in my life, I've been a lawyer, an artist, a jeweller, a father, grandfather, I’ve gained love and I’ve lost love, I've been to some wonderful places, met some wonderful people, eaten delicious food, drank fabulous wines and I've been a husband... (he chuckled)... twice.Well I never did." He always wanted a family business and we often talked about plans for the future so I am both extrememly lucky and excited to be able to carry on his legacy. Although we have worked together for several years now they will still remain a large and very dynamic pair of shoes to fill."